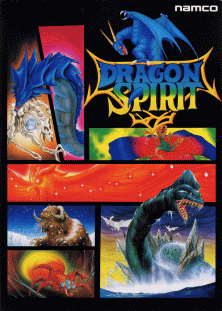 Dragon Spirit scorches the screen with a mythical fantasy theme hot enough to thrill players throughout the land. Come with us and journey to a time long ago when prehistoric beings populated the globe. Where after a millenium of captivity, an ugly serpent demon named "Zawell" escapes imprisonment and kidnaps Alicia, princess to the kingdom of Mitgult. A young, crafty soldier Amul is selected to rescue the princess and destroy Zawell. In praying to the gods for strength and courage, he points his sword high toward the heavens. Suddenly he is transformed into an all-powerful blue dragon, bestowed with special powers. 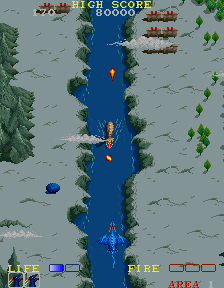 Though gifted with a lethal air and ground attack, this is not enough. He must locate and optain extra powers alongthe way. The demon has instructed nine of the mightiest beasts to stop Amul before reaching his goal. Do not underestimate this soldier… he has the Dragon Spirit!